In 2015, reefs in American Samoa saw the worst of that year’s bleaching in February . In 2016, they seem to be holding on. Last time we looked at how the natural resilience of American Samoa’s corals are helping stave off bleaching events, and it seems to be paying off. 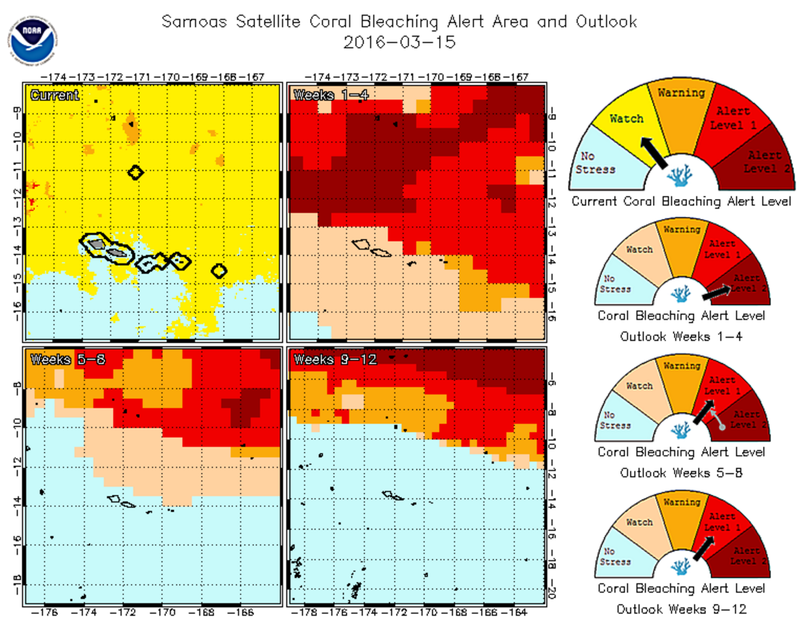 Unfortunately, it seems like coral bleaching threats in the Samoan region are just now starting to heat up. According to monitoring and predictions from NOAA’s Coral Reef Watch, the Samoan region is under a “Bleaching Watch”, but if patterns from last year follow, the situation will become dire in a matter of weeks . Within the next month, things will get worse but quickly spring back to normal. 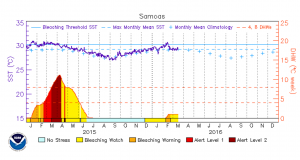 One to four weeks from now, the Samoan region will experience the highest bleaching warning level, “Alert Level 2”, but after that, things will begin to improve. While bleaching stress will still be strong in the general region, the waters in and around American Samoa should be experiencing no bleaching stress at all . So why had bleaching not hit American Samoa so hard yet? It could be that aren’t as bad this year since the El Niño has passed its maximum . One thing is for certain though, coral bleaching in 2016 is not over. 1.) Kahn, Brian. “Longest Global Coral Bleaching On Record Isn’t Over Yet.”ClimateCentral. Climate Central, 23 Feb. 2016. Web. <http://www.climatecentral.org/news/longest-global-coral-bleaching-20062>. 2.) 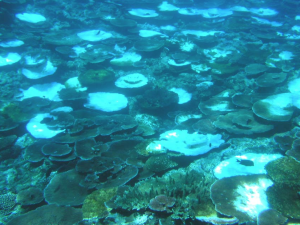 “Polynesia 5-km Coral Bleaching Data Products.” NOAA Coral Reef Watch. US Department of Commerce, Mar. 2016. Web.<http://coralreefwatch.noaa.gov/vs/timeseries/polynesia.php>. 3.) 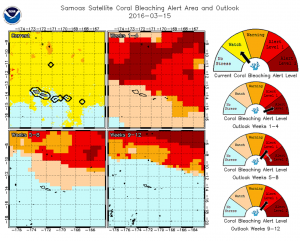 “Samoas 5-km Bleaching Thermal Stress Gauges.” NOAA Coral Reef Watch. US Department of Commerce, 15 Mar. 2016. <http://coralreefwatch.noaa.gov/vs/gauges/samoas.php>. This entry was posted in Uncategorized and tagged 2016, American Samoa, bleaching, conservation, Coral Reefs, mass bleaching event, NOAA, Pacific, resilience, south pacific, update. Bookmark the permalink.